I am afraid that this post will not be a restart of me posting on a regular basis. My work is very busy and very tough right now. We finish at about 8pm everyday and I’m just a little tired. Once things settle down I’ll be back and share with you my ramblings out here on the road. I write a regular post for the Library of Congress’ blog and that has taken a priority, until tonight. So I will share a little bit about the wonderful visit we has in Marietta, OH. This honestly should make your short-list for a great place to blow a weekend. We often talk about where we are and what was seen but this is going to be a blatant promotion of the Hotel Lafayette and the eateries in Marietta. Fear not there is a funny story to be found. We checked into this historic and fabulous hotel on our first night in town and found a four-poster bed waiting for us. Oh that’s all well and good but our tiny little dog with tiny little legs could not climb the steps necessary to get into bed. Yes it was that tall! Some would say oh that’s not a big deal but, well, Pippi sleeps with us. She does because we like it, so for three days the poor thing had to be lifted in and out of bed. Don’t cry for Pippi however, she enjoyed the couch and chairs about the room too. She also got a little celebrity nod, you all know she is famous but the folks at LOC are just learning that. She had to meet some fans and snap some pics while in Marietta. Now I really fell in love with this hotel, the staff was great. The power went out while we were there and the staff came around, softly knocking on doors to offer oil lamps to guests. Would have been romantic if we had not worked a 10 hour day. Just a wonderful way to handle a bad situation. 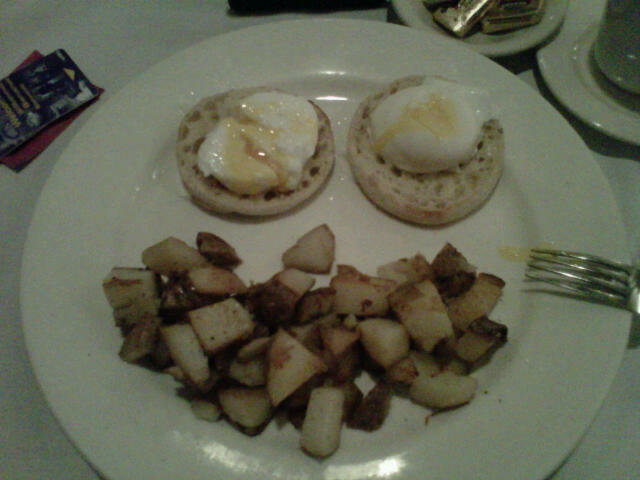 Then to top it all off the chef at breakfast made me this, poached smiling eggs!!! We also dined in Marietta, surprise, you all know we like to eat well. I have to say that we might have eaten too well here. Not only did we use a weeks per diem on just three days worth of meals but it will take a mile high menu to top what we found here. One dish was a sockeye salmon wrapped in a fluffy pastry, can you go wrong there! We even had dessert, it takes a pretty great meal to inspire us to finish with a sweet. Folks I’m telling you this is a gem. It sounds like you are enjoying the best that small town America has to offer! !